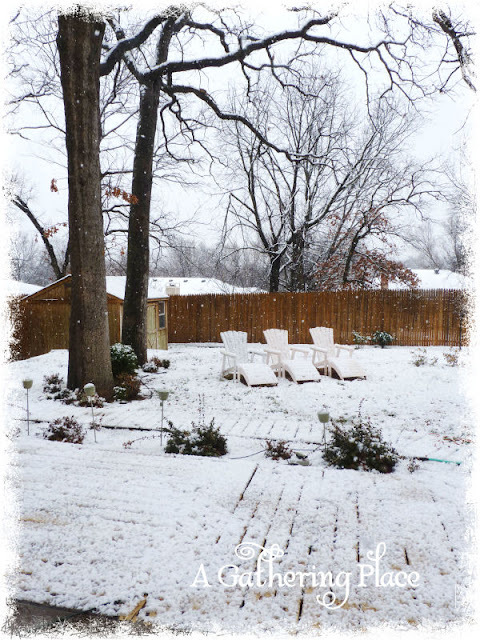 Winter has finally come to Oklahoma and I'm trying desperately to be a good California Girl and not WHINE about the sleet and snow that will soon blanket the ground. (I'm happy with the rain tho~we need it!) I guess after being cooped up from hand surgery for so long I WANNA GET OUTA HERE and have some fun. 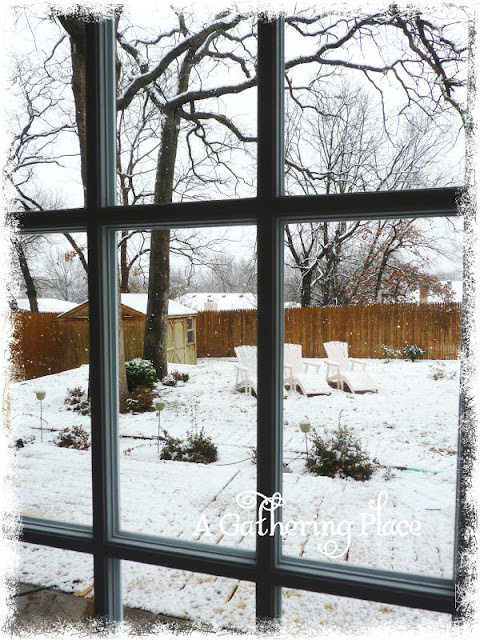 That said...I know Spring is around the corner and glorious days of junkin' and slummin' are on the horizon! See the vintage dress form at the top? It is a great old piece and made of wood. I can't wait to do something fabulous to it! 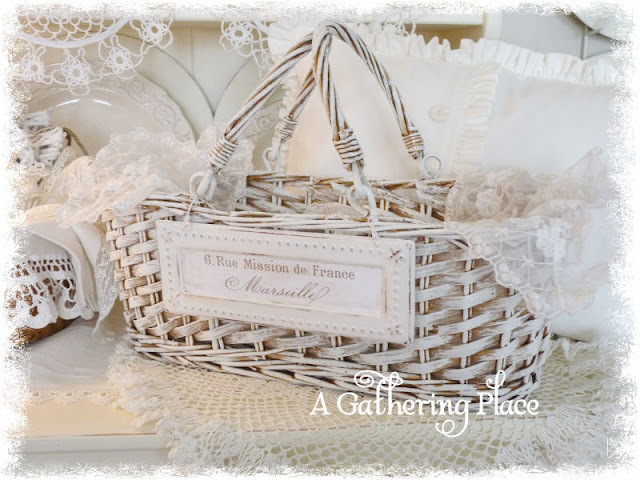 I'm thinking vintage lace, etc. About three years ago my big sister rescued the one above from the TRASH and we had so much fun recovering it. She uses hers in her shop for display (I borrowed the picture from Facebook) and everyone wants to buy it! Imagine that! 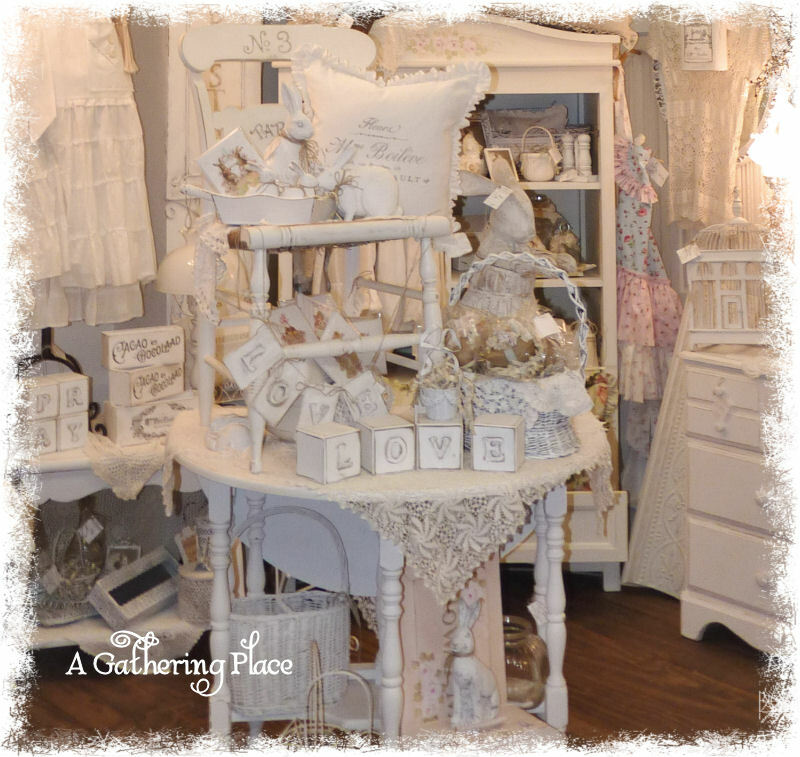 :) Her shoppe is in Dickson, Tennessee and it is darling! 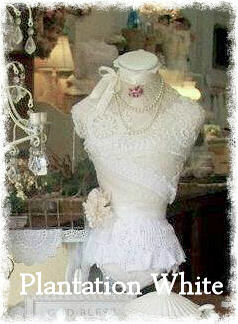 If you are close to Nashville you MUST go visit PLANTATION WHITE! 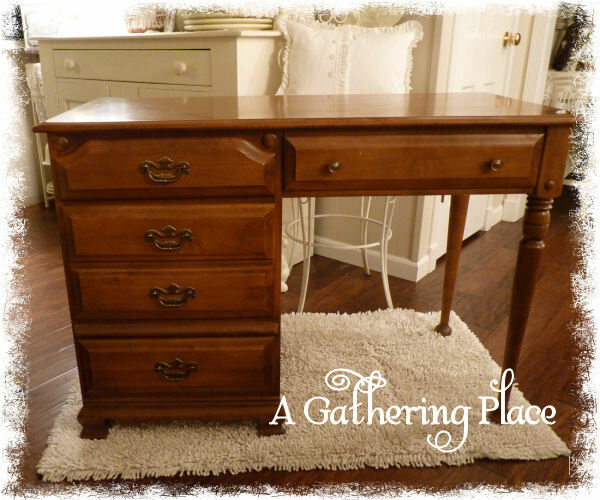 On Saturday I did a little bit of local tag sale shopping and I snagged this awesome solid wood desk. She's screaming out for a makeover and I'm going to give it to her! I can just see this beauty dressed to the nines with my favorite soft white paint! YUM! 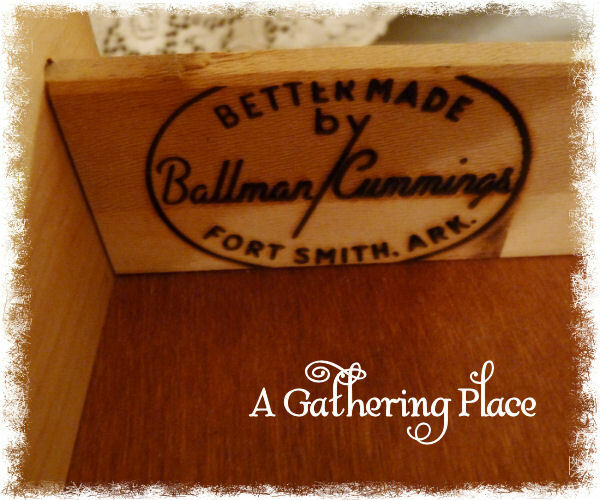 The inside of the widest drawer had the burn-stamp of Ballman/Cummings - Ft. Smith, Ark. I just found an amazing article on this company...you can find it HERE. I just found a dresser and mirror on eBay and it's price is $700. Oh My Gosh...not gonna say what I paid for the desk but it wasn't anywhere CLOSE to that price! This week I'll be working on restocking my suffering website. 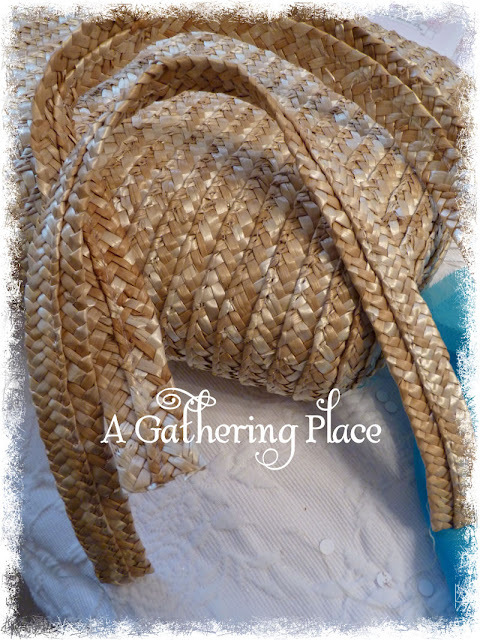 I haven't listed anything new since before my surgery so I have LOTS to catch up on! 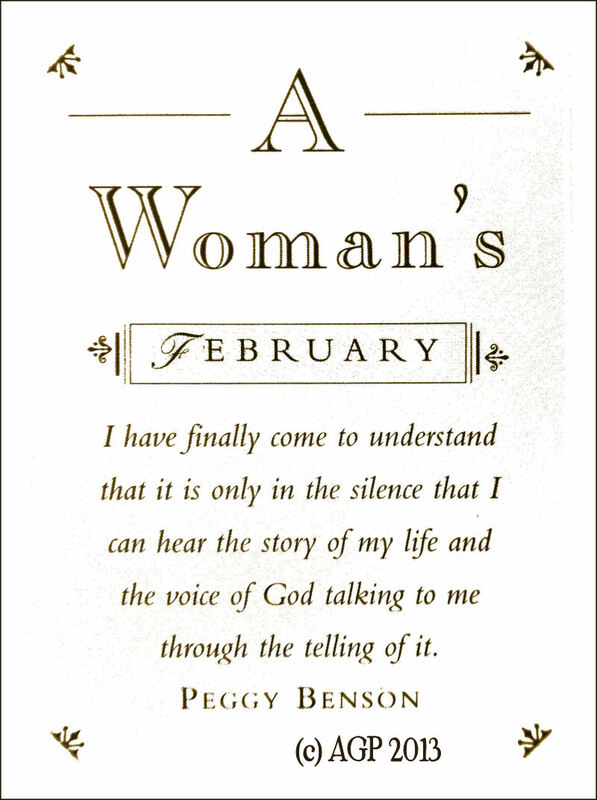 I heard Peggy Benson (wife of the late Bob Benson from Benson Publishing) speak way back in the early 1990's and have never forgotten feeling totally mesmerized while hearing her life's story. Here I am, nearly twenty years later, and I find the wisdom behind her words still ring true. She looked at my Mr. AGPMan (who was working on lighting behind me) and shared how she prayed for a long and happy marriage and a peaceful childhood for her children. through the telling of it." 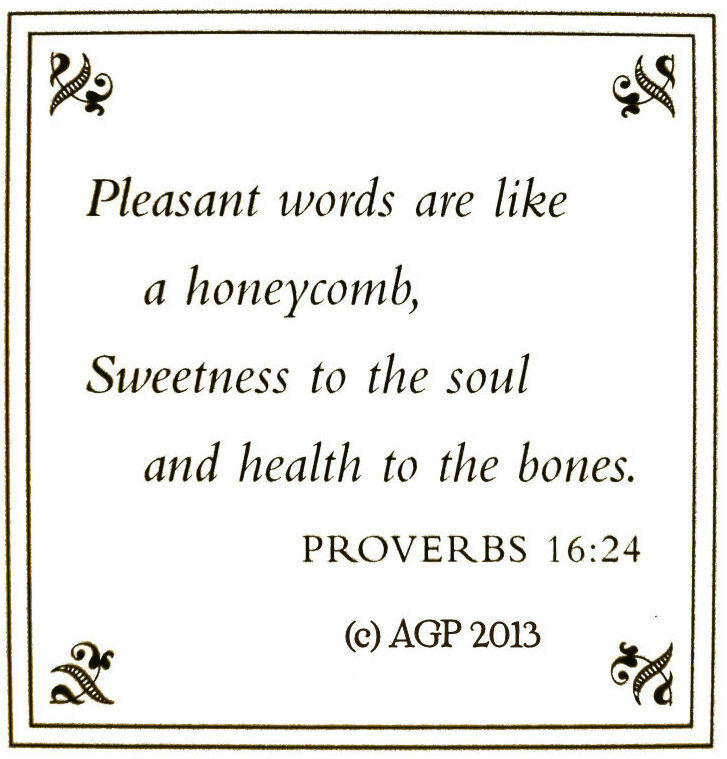 Blessings for a lovely Sunday! 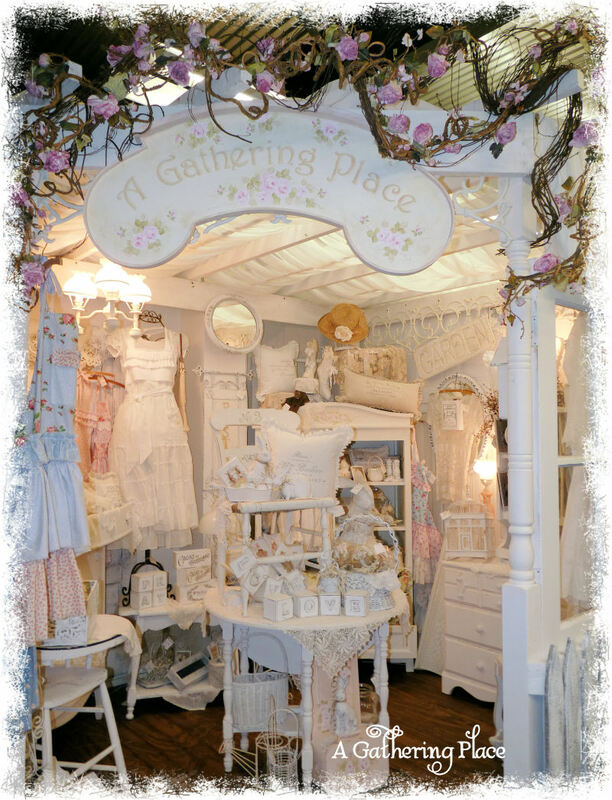 For the last couple of weeks I've pretty much worked non-stop on my new Booth Space at Serendipity Market in Edmond, Oklahoma. Yesterday I finished putting some of the final touches on a few Spring and Easter displays and tomorrow morning I will return to tag a couple pieces of furniture and some odds and ends. It's hard to get anything done because it's so much fun visiting with all the shoppers! Unfortunately I was only able to snap a couple of pictures!! :( My camera battery died after only two snaps and I didn't have my spare with me! I so wanted to show you the amazing pergola style framework my hubby, aka: my Mr. AGPMan, made from my previous booth space. He also laid an awesome wood floor for me out of stained/grooved plywood. It sits underneath the posts and vintage doors which easily hold it in place. I love it. Promise to show more pictures soon! Since my hubster is down with some BUG there won't be any junkin' this weekend for the two of us. We're do for a rest anyway...all the painting, moving, building and decorating has worn us out! 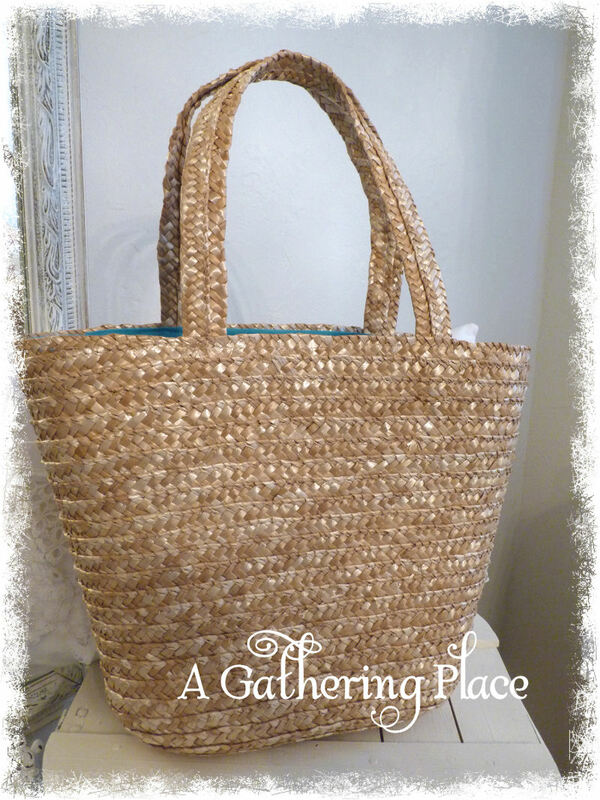 Today I'm going to share with you a wee little tutorial on how a thrift store wicker bag was transformed from something junky into something très chic and totalleeee fab!!! First thing I did was careful snip the lining out as I needed to use it for a pattern for the new linen fabric I chose for the inside! 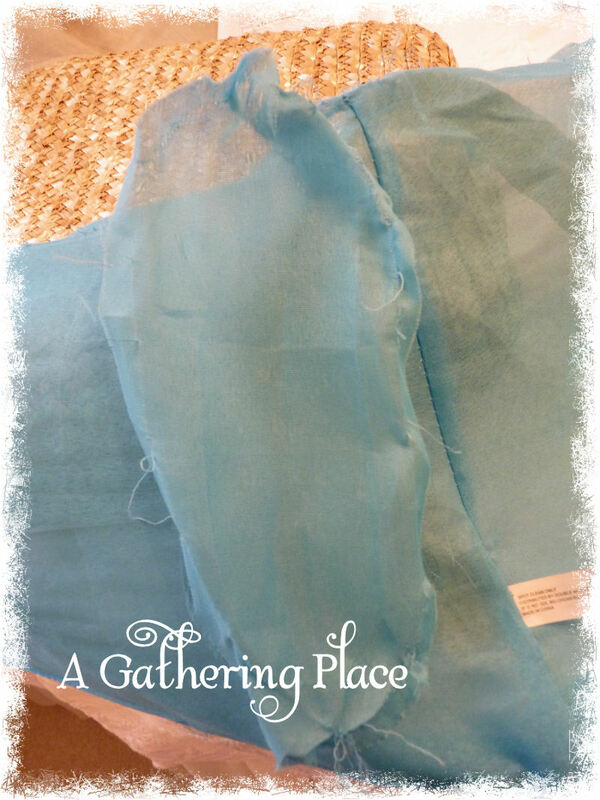 After the blue fabric was removed I cut a new fabric liner making note of the seam allowance used. 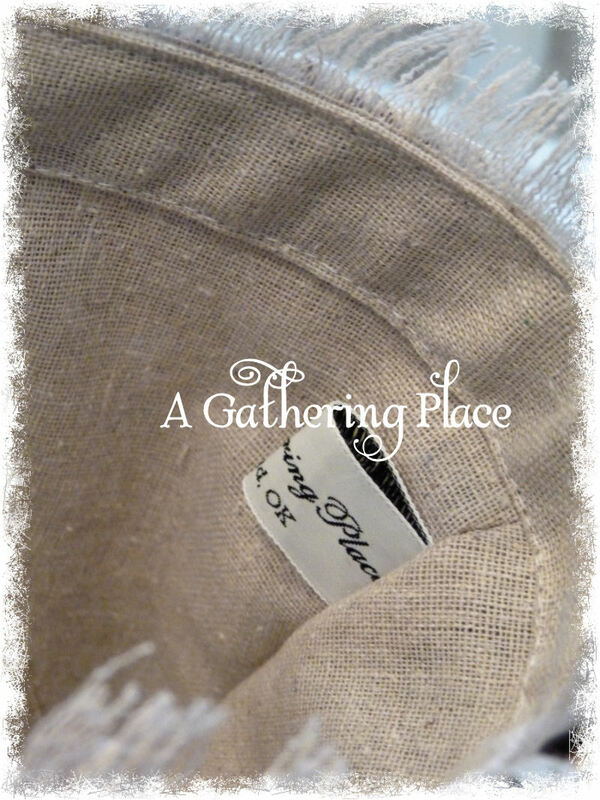 I chose a natural linen!!! Didn't expect for the handle to come off with the fabric...I just hot glued them back into place vs. stitching them down. Next I lightly brush painted (sorry...forgot to photograph it!) the entire wicker tote with my favorite soft white paint. No need to paint the inside but I did lightly coat the upper inside rim!!! I let it dry overnight! The new fabric was frayed for a fringed effect and since I planned on hot gluing it into place (instead of sewing it down) a band of matching fabric was stitched close to the frayed edge. Once the liner was sewn together it was attached to the inside, raw side against the inside of the Tote! After the lining was in place the outside handle was decorated with roses, vintage French Net Lace and loops of old bobbin lace, too! 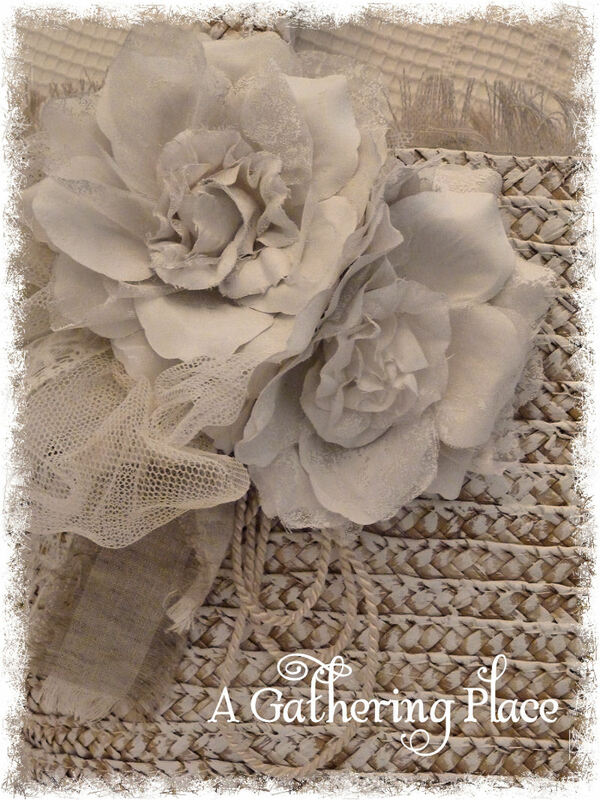 A little braid and a bit of frayed linen was also added to the floral mix! An so there you have it! A transformed Tote Bag that took MAYBE an hour to create!!! 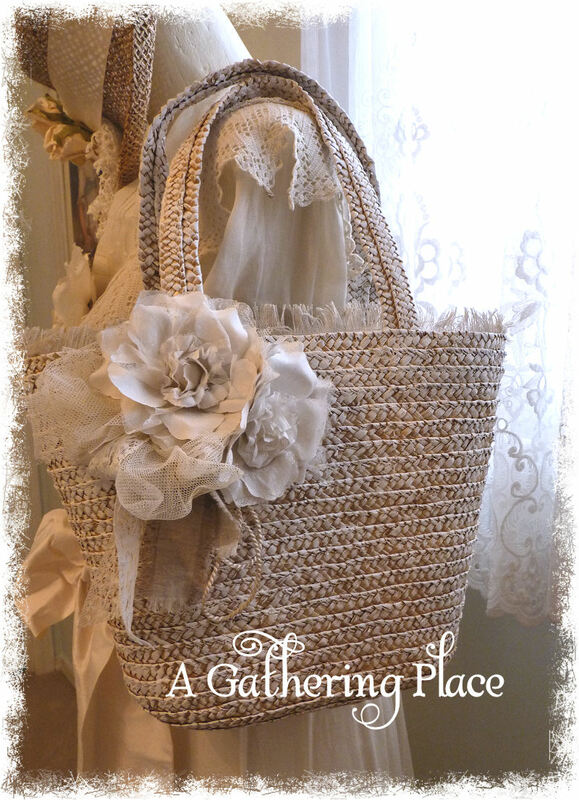 This was a fun project and a sweet addition to most any booth space or shoppe! I'm headed back down to my new booth space to price more product today!!! It's snowing outside so I'm having a slow-motion day... Hard to leave the cozy comfort of my home!!! Hope to share pictures soon! 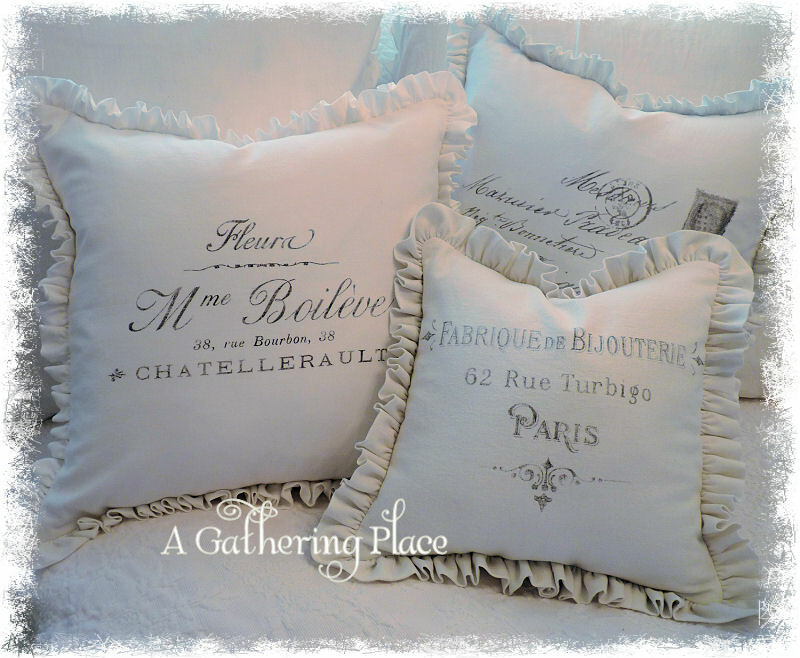 On Saturday I showed you some of the latest French themed pillows destined for my local booth space at Serendipity Market (Edmond, OK)... Hope to have my wee little shoppe up and running and fully stocked in a couple of days. Sooo much work to do...hauling of furniture, pricing/tagging and lots of arranging! Today I'm sharing with you another pillow and I hope you'll be inspired to create something similar while re-purposing great used, vintage or second-hand clothes. We all know our local thrift stores are filled up and over flowing with such things, right? I love working with linen, flax and high quality cottons when making pillows. 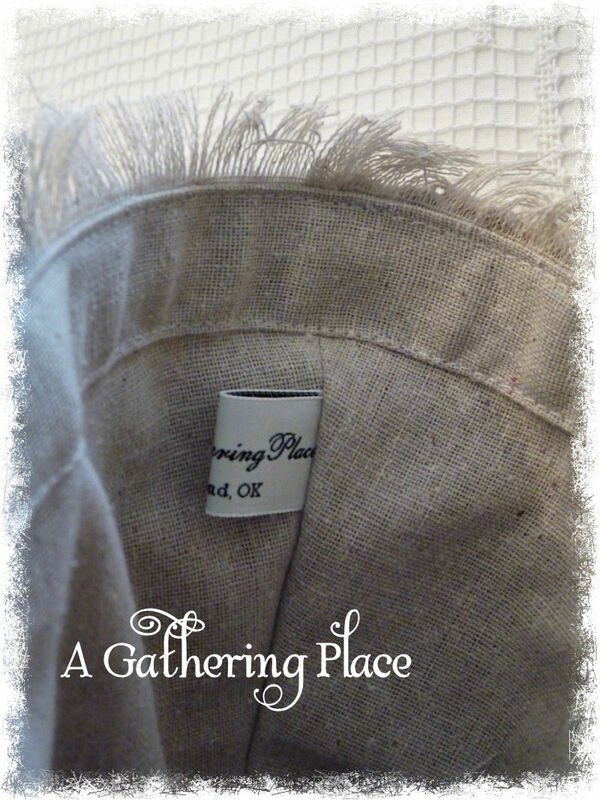 The problem is the yardage is sooo expensive that once you purchase the fabric and either poly-filling or a feather insert the cost can truly get sky-high. 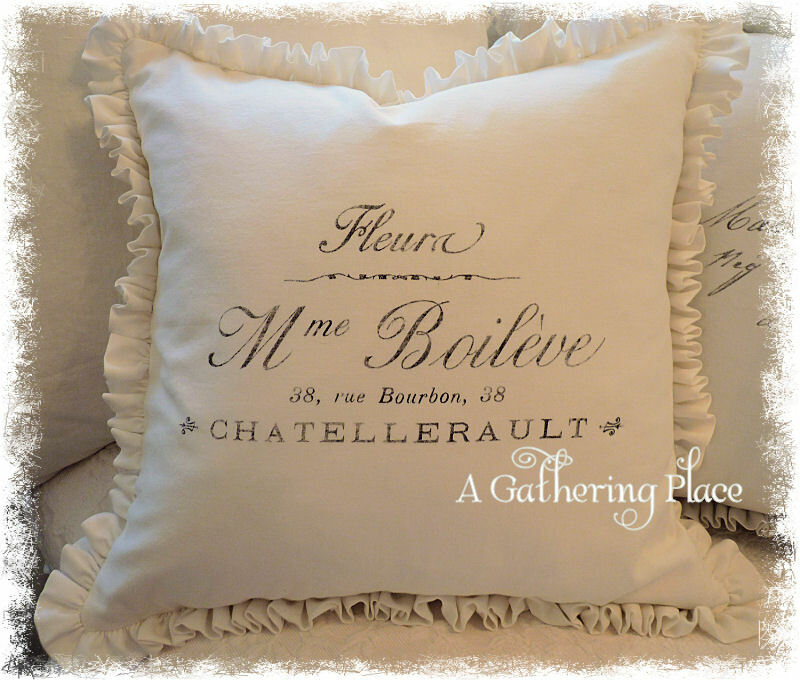 I found this great late 1990's Eddie Bauer dress for a few dollars and knew it would be fabulous made into a pillow. It had shell buttons down the entire front and since it was made of 100% linen it had this wonderful color and texture to the cloth. The entire skirt portion was used for the pillow...or about a yard (plus a little) of fabric! To make this pillow out of new and comparable linen it would have cost me three or more times as much! An added bonus was the front panel was perfect for the buttoned back! 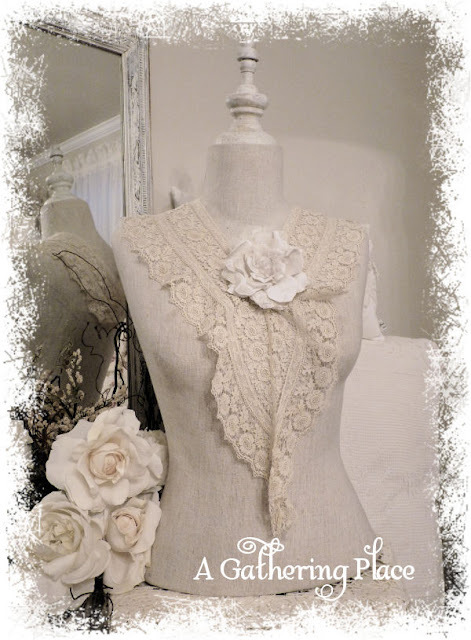 LOVE THAT and no buttonholes to make or buttons to sew on! I'm going to be in and out this week transforming my booth into what will hopefully be a sweet place to shop! Hope your week is fabulous! I've been a busy bee sewing and painting up a storm. Such fun! I've finally made use of the vintage images I've collected while visiting the ever popular Karen at GF!!!. 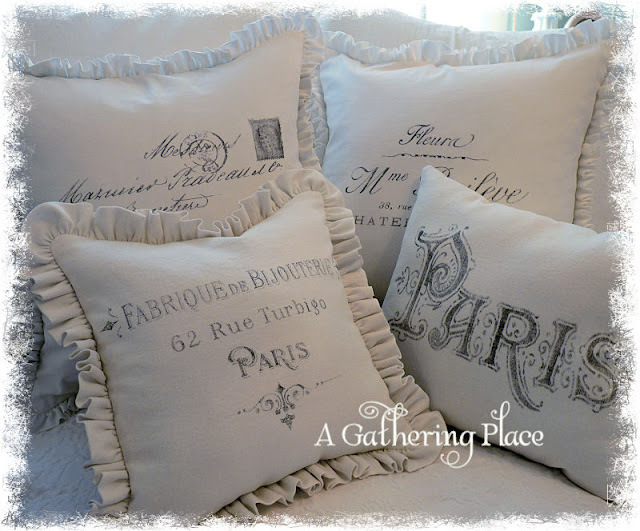 I love, love, love how her graphics look when used on simple white cotton and linen pillows! 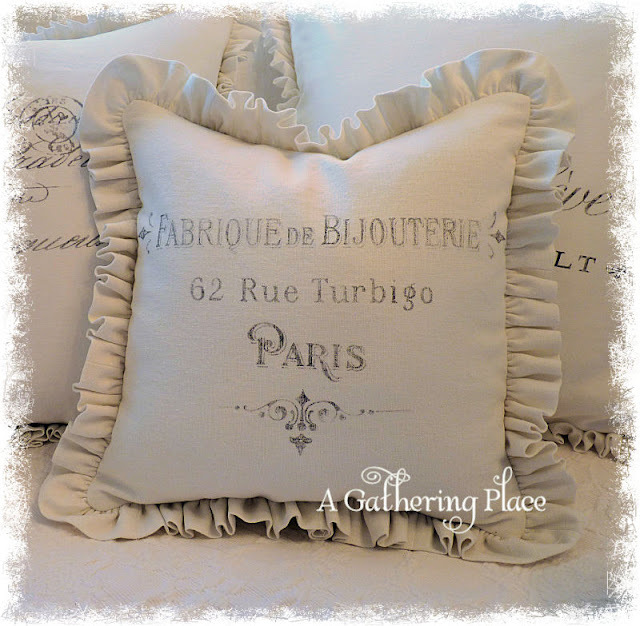 Nothing complicated here...petite ruffles combined with the old ephemera and feather inserts make for French themed pillows that are easy on the eye. I love all of the old images, but my favorite one was used on the first pillow at the top! 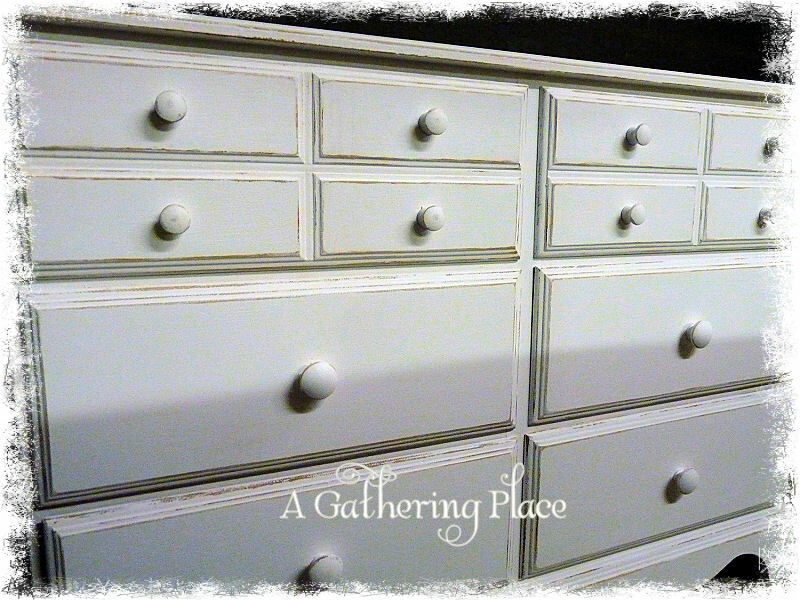 I also snagged another mid-century maple dresser and recently painted it out in my favorite soft white paint. This piece is almost exactly like one I sold last year that I painted pink. 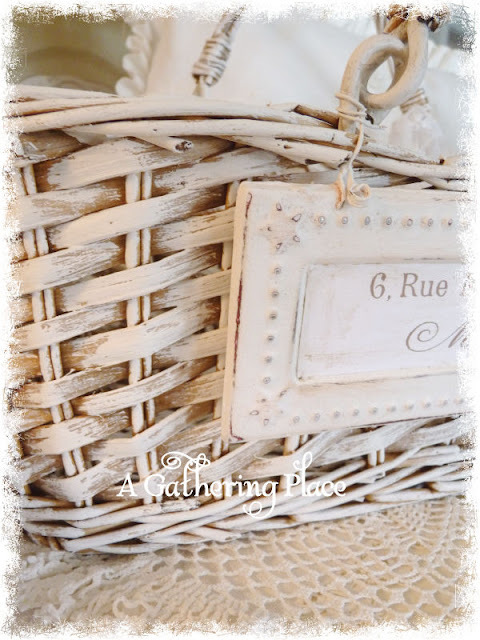 Love this one in white...simple paint techniques, gentle distressing and a quick sealer help to make her home-ready! I hope you all had a wonderful Valentine's Day! I made Chicken Spaghetti for my family and then we all played UNO until almost midnight. Guess who one? NOT ME! 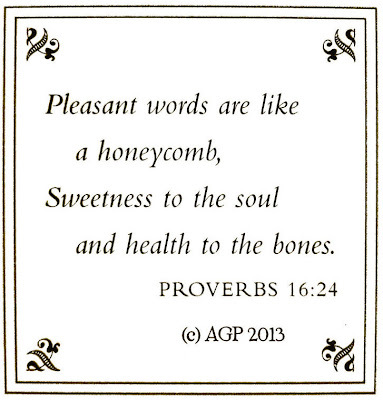 Hope your Saturday is wonderful! I decided to haul it home. 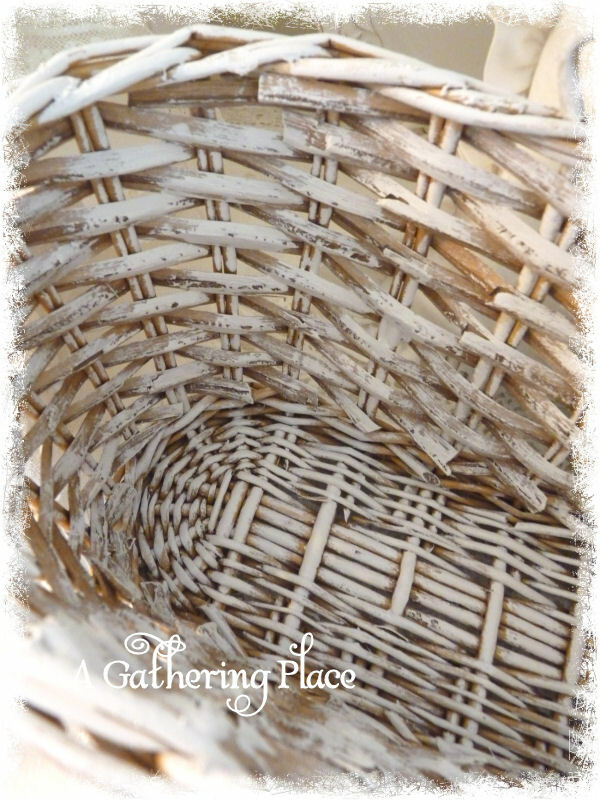 With a chip brush (super inexpensive at Home Depot) I dry-brushed the entire basket. Gave it one coat and let it dry. One more light coating and the basket was instantly transformed. Dry brushing allows some of the original base color to show through and I love this not-too-perfect look! 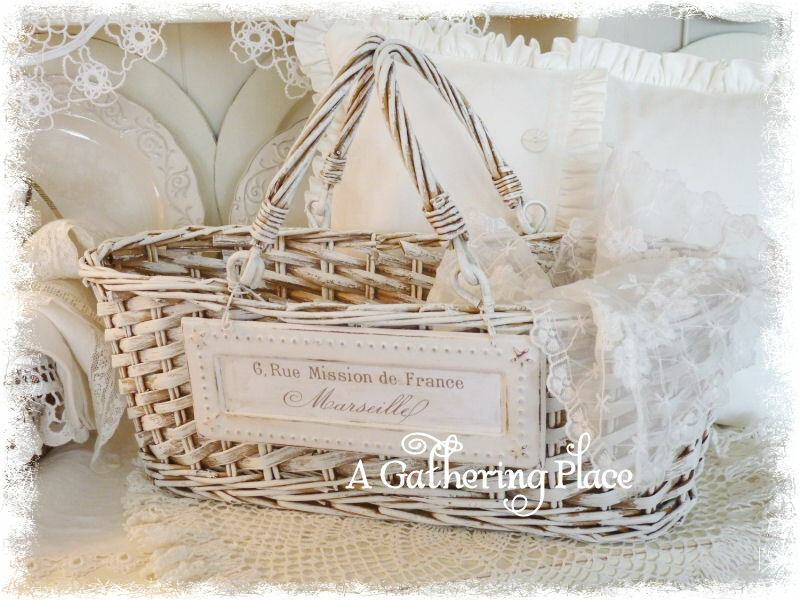 Now~after staring at the basket it seemed to need just little bit of SOMETHING EXTRA~something like a sign (similar to those seen around the neck of a wine bottle). Then I remembered I had purchased some metal hangers on clearance at a local craft store last summer and hoped at least one would add the needed bit of pizzazz I was looking for! Total basket makeover cost was about $3. 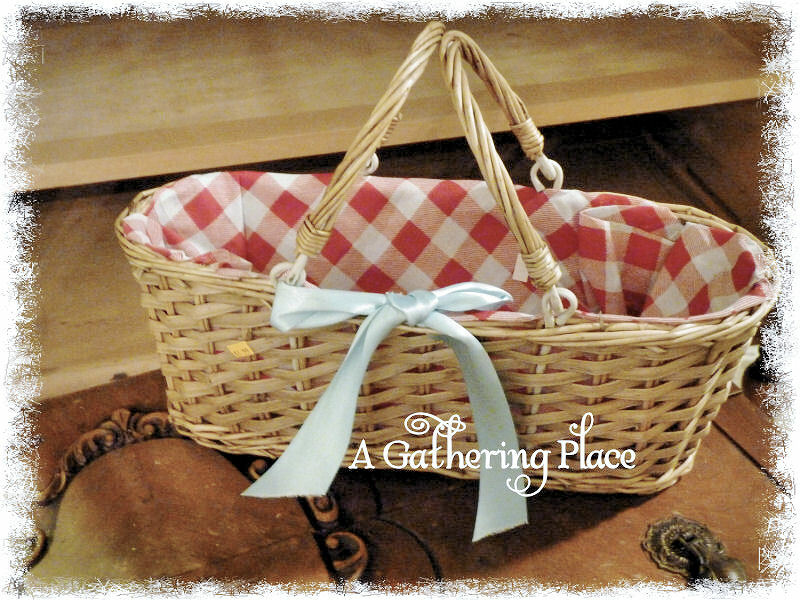 Basket was $1.99. Hanger was .25. Ink and paper (for printing) and the paint didn't cost more than .75, at most! This was a fun and easy project and if you decide to do something similar I'd love to see what you come up with! Tomorrow is Valentine's Day...can't wait! Now...I don't camp out at our local Craigslist site even though I probably should visit it more often that I do. 'Tis true there is allllottta junk listed for sale, but every once in awhile it is possible to score something wonderful! 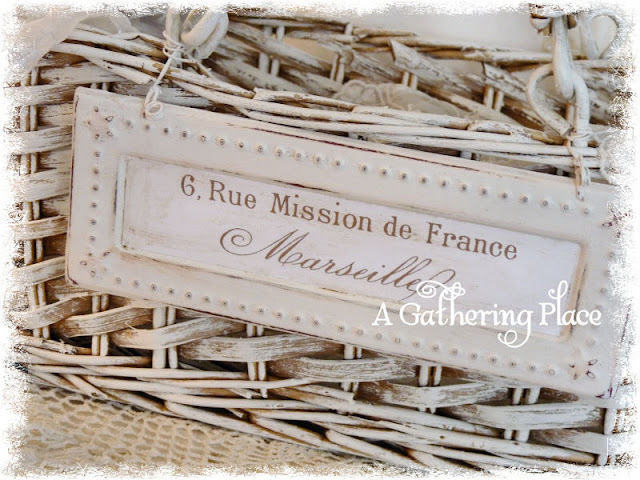 Last summer I purchased a French Cabinet for $50 and I still swoon when I think about it! Well...a couple of days ago I happened to log onto the CL website looking for a couple of pieces of furniture begging for a makeover (I'm on a quest to fill up my soon-to-open booth space). After perusing several categories (antiques, vintage, furniture, etc.) I stumbled upon a listing for a Vintage/Antique Chest that caught my eye. After a quick phone call to make sure it was still available my guy and I headed out the door to view the piece in person. The chest was about 15 miles from our home and so it only took a few minutes to get there. A nice man met us outside his beautiful home and he quickly led us to the garage where the chest was being stored. After looking over the piece and making sure it wasn't falling completely apart (strong drawers, no missing hardware, no big gashes or broken legs, etc.) we agreed on a price and the deal was done. Pretty fun, but slightly ho-hum story, right? After chatting with the seller for a few minutes we found out we attended the same Oklahoma University (SNU/Bethany) back in the late 70's and shared mutual friends. Then we discovered he knew my sister and bro-in-love in Tennessee very well and had once been my sister's boss. I've shared before how I don't (and never will) believe in coincidences! I love it when I'm reminded that my steps are ordered and directed by The Most High. My project for early next week is to whip this baby into shape using some AS paint with maybe some glazing...hmmmm. White paint is in it's future for sure. 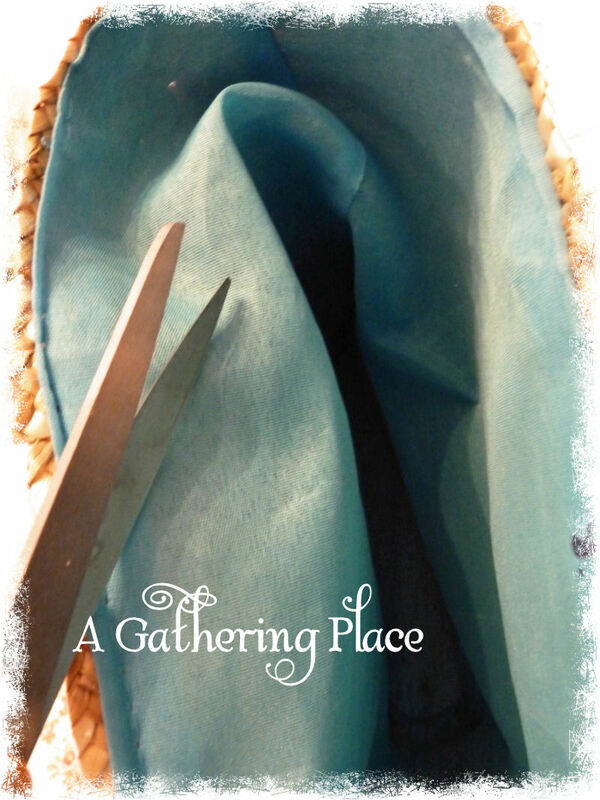 Promise to share with you the process as I go!